BC Transit Police took their task of protecting Vancouver during the 2010 Winter Olympics very seriously. 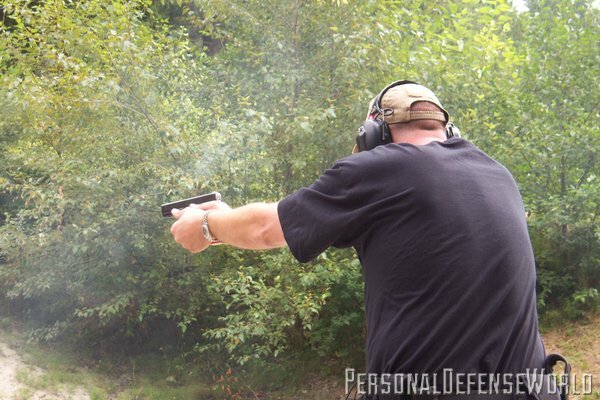 They trained extensively with GLOCK 22s. Terrorists have targeted mass transit networks in busy cities several times. 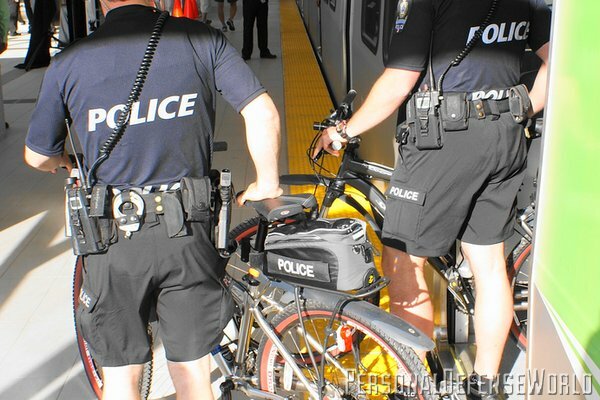 Transit officers rely upon bicycles while patrolling LRT Skytrains. BC Transit Police took their task of protecting Vancouver during the 2010 Winter Olympics very seriously. They trained extensively with coordinated outreach efforts (right). In the post-9/11 world, community policing and multi-jurisdictional police departments have become effective tools in preventing major terror attacks in North America. 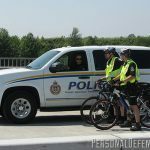 While not the largest police agency in the world, the British Columbia Transportation Authority Police Service (or “Transit Police”) was called upon to provide security to an attractive terror target, the 2010 Olympic Winter Games held in Vancouver, Canada. The Transit Police is the first multi-jurisdictional police force in Canada dedicated to creating a safe and friendly public transit system. Recalling the Spanish terror incident in 2004, where 191 individuals were killed and more than 1,800 people injured, mass transit makes an attractive target for those with extreme agendas. Mass transit, most notably buses and light rail, were the preferred method of moving visitors attending the Winter Games. As such, the risk of attack was justifiably high. Enter the British Columbia Transit Police. 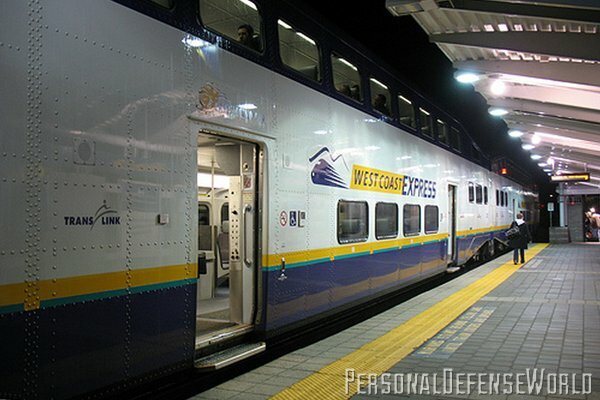 Responsible for policing the entire transportation network operating in British Columbia’s South Coast region, including metropolitan Vancouver, the agency polices commuter trains, buses, LRT Skytrains, Sea Buses and passenger vehicle routes. 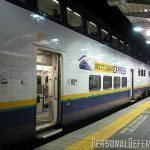 With nearly 3 million passengers per day traveling across 21 municipalities throughout the entire Vancouver area, the area of responsibility is understandably large. The Transit Police are Vancouver’s true beat police—on foot, on trains, on buses, and in and around the stations. And don’t mistake the Transit Police as Dudley Do-Right—these are true professionals that are armed and ready to protect against a terror attack. 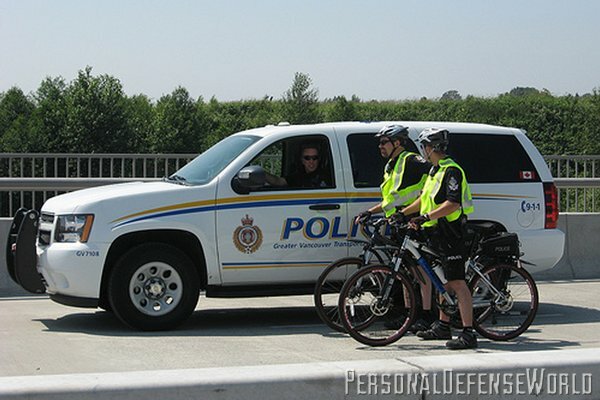 Working in conjunction with the Royal Canadian Mounted Police (RCMP), the Vancouver Police Department, local fire departments, and members of neighboring police agencies, the Transit Police strive to achieve a “seamless” form of policing between jurisdictions in the region. 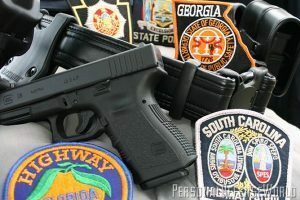 Armed with the GLOCK 22 semi-auto pistol for uniformed carry and the GLOCK 27 semi-auto pistol for concealed or plainclothes duty, the Transit Police rely upon the 100 percent reliability of the GLOCK system. “We don’t carry a backup firearm,” says Officer Darrin Chaplin, director of training for the department. In fact, the Transit Police rely solely upon their GLOCK pistols. They have no rifles, shotguns or other tactical systems typically employed by other police agencies. Although there have been many instances where Transit Police officers have been forced to “draw and display” their firearms during an incident, the department is happy to report that there has never been a discharge of a Transit Police-issued firearm outside of training. As a result of the absolute confidence in the GLOCK pistol, the Transit Police have no plans to switch to another pistol manufacturer. 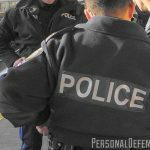 Instead, the agency notes that one of the most difficult challenges in training officers comes when the department hires officers laterally from another policing agency. As new hires, the lateral hires must qualify with their issued equipment before being eligible for operational duty. 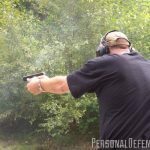 Years of training and patrol with another weapon system requires firearm instructors to be more diligent in teaching the GLOCK pistol platform. Despite having to overcome potentially bad habits caused by other weapon systems, training officers report that two hours of classroom instruction on the nomenclature and function of the GLOCK firearm, followed by two 8-hour live-fire training sessions, typically results in the lateral hires qualifying as required and without remedial training. As with most agencies, the price of ammunition and training supplies challenges instructional staff to be creative with lesson plans and to extract maximum success for minimal costs. As the price of ammunition continues to increase due to rising commodity prices, additional training includes regular use of Simunition FX marking cartridges and the potential addition of a FATS simulator. With such a broad area of responsibility and with constant public interaction, Transit Police officers deal with all types of crime. While the most serious investigations such as homicides, organized crime and gang violence are handled by each jurisdictional agency, the Transit Police deal with a wide range of lower-level offenses that include theft, assault, robbery, harassment, drug offenses, fraud, domestic disturbances and even fare evasion. Understandably, the use of force must be regulated for lesser instances of crime. In terms of less-lethal options, the Transit Police employ OC spray, ASP batons and Taser X26 technologies. 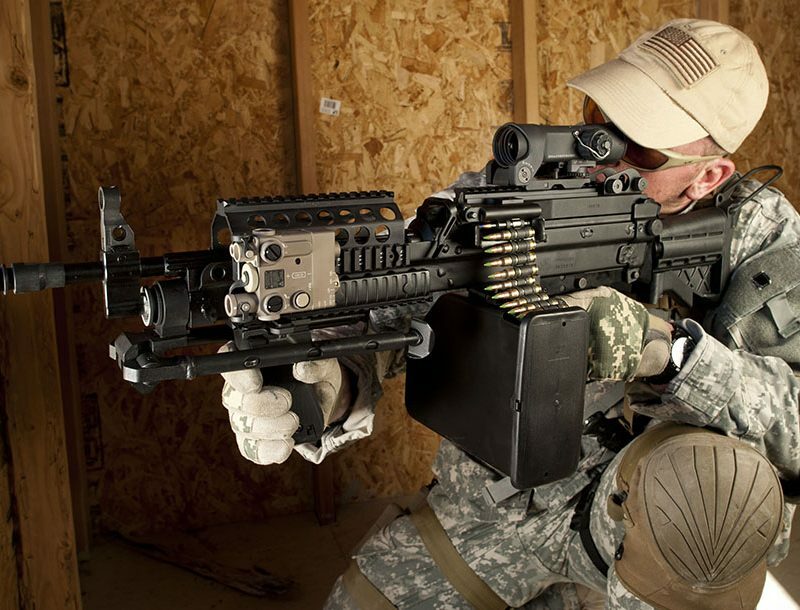 Officers report that simply having the X26 on their duty belt often inspires compliance with even the most difficult customers. The Vancouver 2010 Winter Olympics saw 24/7 preventive coverage throughout the entire transportation network. 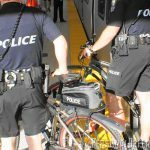 The Transit Police had a visible 24-hour presence throughout 21 municipalities, at all 48 Skytrain and Canada Line stations, and performed regular roving patrols throughout the Sea Bus terminals and along the bus routes. 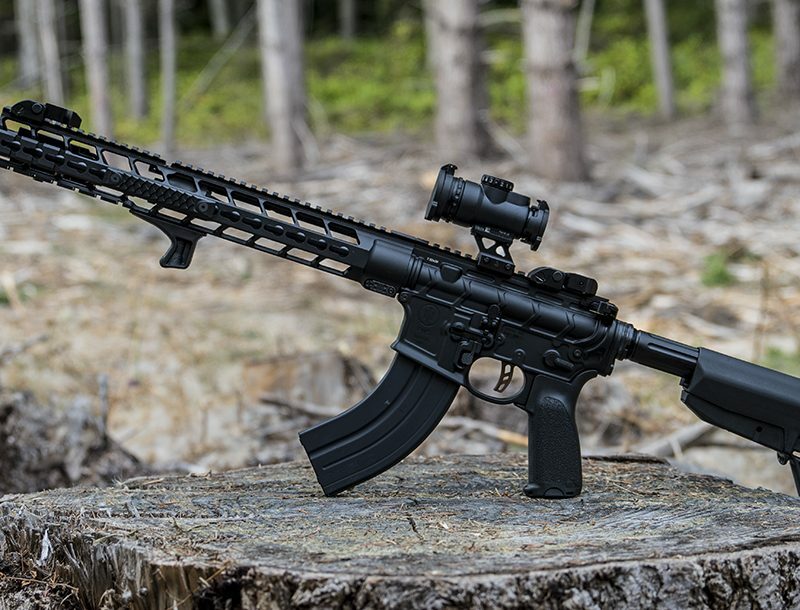 In addition to this, officers were also assigned to specialty duties with the Regional Tactical Troop and plainclothes units and performed designated high-visibility initiatives to discourage any planned acts of violence. As reported by the media, this coverage was crucial in preventing the occurrence of any large-scale critical incidents, such as protests, riots or terrorist attacks. Although we may never know whether a terror attack against the 2010 Winter Olympics was contemplated or planned, the presence of the Transit Police undoubtedly acted as a visible deterrent to provide a sense of security and deterrence for the thousands of Canadian and foreign visitors that enjoyed attending the 2010 Winter games. Focusing upon values that include accountability, integrity, professionalism, teamwork and respect, the Transit Police are true professionals, tasked with the difficult job of policing a modern metropolitan transit system. Nevertheless, like true professionals, the officers of the Transit Police have risen to the task and performed as required. 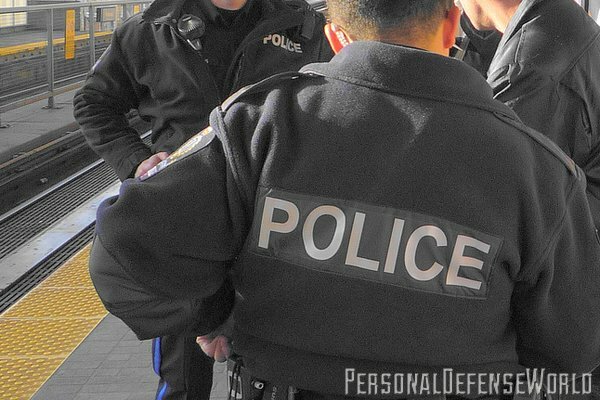 Relying entirely upon the GLOCK pistols as their duty weapon, the Transit Police stand ready to protect and defend.